IBWIRE is the most comprehensive and cost effective way to distribute your press release to the world. We're very confident that you will obtain the results you're looking for, act now and get your press release sent. Google is powerful, everyone knows that. Your press release will be entering Google News within 30mins once your press release is approved. IBWIRE’s guaranteed entrance to Google News will make your press release searchable to 65 million Google News visitors. Your news will be searchable on Google search as well as Google News and it will spread all over the website through syndication and social media. Our news are also well searched and distributed to other major search engines such as Yahoo, Bing, Ask, Lycos and more. IBWIRE guarantees that your news will be distributed and syndicated to various major online newspapers. We don't just merely say we will try that your press release will get exposure if you get lucky. 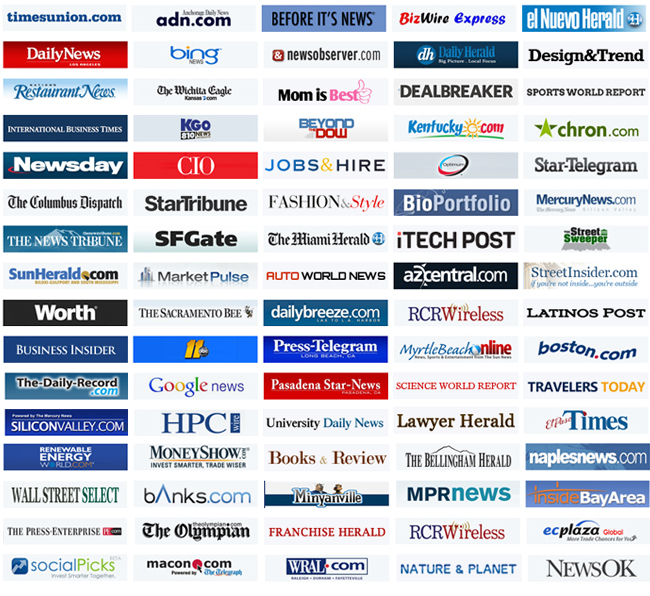 IBWIRE has exclusive partnerships with various publications. Below is the full list of publications that we Exclusively work with. IBWIRE offers the most competitive price online. We don't over charge you with hundreds of dollars, but we have only one simple effective package with the price of $80 per press release. (No one can beat our price with guaranteed placement service as such) – If you recharge bigger amount at once you also get discounted price. Due to IBWIRE's massive guaranteed distribution, your press releases will spread your links all over the internet. Our SEO friendly page setting will significantly help you to online visibility in short-term and in long-term. Also, your press release on IBWIRE will be hosted for good and the links that you get your site will stay forever as well. IBWIRE is the best way to build inbound links for your website for SEO enhancement. Your press release is made readily available to be distributed to major social network sites such as Twitter, Facebook and Linkedin (and more). IBWIRE shows links to its distribution channels as a proof of distribution to our clients to build trust.